In advance of this weekend’s race, WIX Filters®, a global manufacturer of filtration products, is proud to partner with up-and-coming driver Trey Hutchens. Hutchens will continue his successful progression through the stock-car ranks at this Saturday’s NASCAR K&N Pro Series East PittLite 125 race at Bristol Motor Speedway. Hutchens will be behind the wheel of the Trey Hutchens Racing No. 14 WIX Filters Chevrolet. The season marks the sixth consecutive year in which the fourth-generation racer has partnered with WIX Filters in a relationship that commenced with the driver’s rookie year in Quarter Midgets. This race is Hutchens’ second trip to Bristol and marks his first NASCAR K&N Pro Series East start in 2015 (his 12th overall). Last week, he scored his first top-10 finish in the NASCAR Whelen Southern Modified Tour in only his second series start. 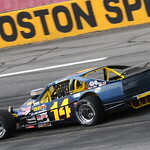 Hutchens has also competed in three NASCAR Whelen Southern Modified Tour races this season, and will continue to run a partial season in both series this year. For more details on Hutchens, follow him on Twitter and Facebook, and for WIX-related information, visit www.wixfilters.com.